April! Signs of spring are everywhere! The early spring flowers are coming through. Also, rhubarb and horseradish are pushing through the soil. My husband, Joe, planted some radishes, peas and sweet corn this week. Time will tell if they will grow. We had rain yesterday and this forenoon. We have been getting some of the yard raked between rains. It looks like it’s turning nicer now. The schoolchildren are enjoying their week off. Yesterday we made noodles and cheese. I tried a different noodle recipe from the one I usually use. The noodles turned out really nice. We’ll have some tonight for supper. I was clear out of noodles, so it was time to make more. I would like to make a few more batches to store for the weeks ahead. We like beef and noodles or chicken and noodles, so they don’t last long around here. 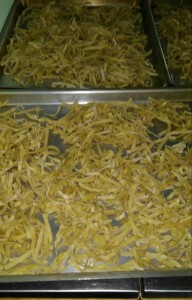 Lovina made fresh noodles last week; see the end of the column for the recipe. Joe, Elizabeth, Susan, Verena and Benjamin are all working today. If the children weren’t home on spring break, I would be the only one home. Verena is enjoying the work she does. She does some office work and helps a lady with organic gardening. They will sell produce, among other items, at flea markets this summer. On Good Friday Joe and I and some of the children attended the wedding of Benjamin and Elizabeth. We enjoyed getting to visit with aunts, uncles, cousins and friends. We arrived back home around 5:30 p.m. 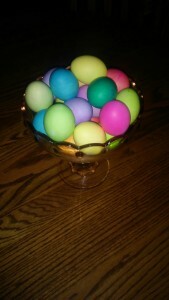 Colorful Easter eggs on the Eichers’ kitchen table. We received several more wedding invitations. Congratulations to nephew John and Arlene! They chose May 29 for their special day. Our neighbor boy Joe and his special friend, Susie, were published in our church on Sunday for a June 4 wedding. Congratulations to them as well! I have been asked to be a cook at both weddings. 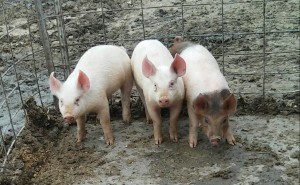 We have three little pigs here now. We have extra milk from our cow, Bessie, to help feed them. Son Kevin, 9, wondered if he could give the pigs names. I told him it would be better to not make friends with them as they will be our meat next winter. Lovina’s son Kevin suggested naming their little pigs. His mother suggested otherwise. I still remember when I was a little girl and my parents butchered one of our favorite old milk cows named Whitey. We had a hard time thinking about her being the beef we were eating. After that, Dad never butchered the milk cows. He would raise other beef for that. An older cow doesn’t make good steaks like a younger steer does. This week, I’ll share the noodle recipe with readers. God bless you! Beat egg yolks, add boiling water and beat quickly until foamy. Pour into flour. Stir until most of the flour is mixed in. Put a lid on the bowl and let stand 10–15 minutes. Put dough on floured table and roll out. Cut into squares and put through noodle maker or cut by hand. Either cook noodles right away or dry for future use. To dry, lay out and turn daily for a week, then store in an airtight container. 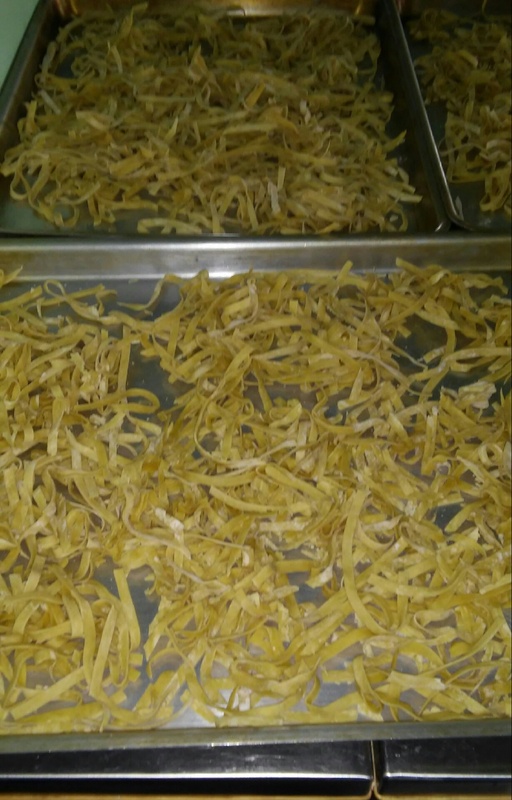 After drying, the noodles can be frozen. Previous PostMaple syrup spring gives way to Amish wedding seasonNext PostGrateful for safekeeping, help from friends and children, plus dandelions! Lovina makes noodle-making sound easy. Might have to give it a try one day. Go for it, Judy, and let us know how they come out!